Hi! 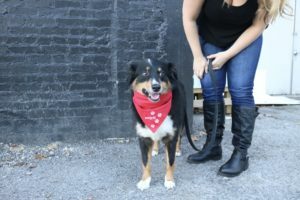 Welcome to The Bark Blogger! My name is Rachel Henderson and I’m from the beautiful state of Michigan. I fell in love with a Texan man (at the Daytona 500 of all places) and am now living in Dallas. Before I moved to Texas, I attended Michigan State University and got my Bachelor’s in Advertising and Public Relations. That is where I got my puppy, Dawson. 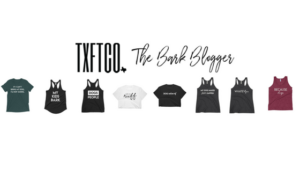 I started The Bark Blogger because dogs are a huge passion of mine and I’ve always wanted to do something with that passion. 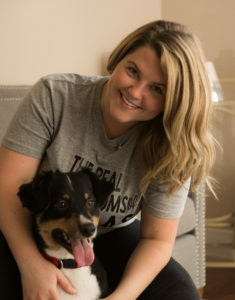 I’m hoping to provide you with some tips, product reviews, DIY treat recipes, and dog-friendly places around Dallas! 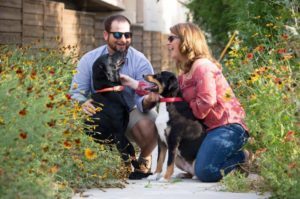 This is my fiancé, Chance, and our two dogs, Dawson and Trigger! Trigger is a Lab/Dalmatian mix and Chance has had him since he was born. Chance’s brother actually still has Trigger’s mom. Dawson is an Aussie/Sheltie mix and I got him when he was 8 weeks old. He’s my everything! These boys are my life and I’m so thankful for them! They are a handful but they make this life worth living.